Concussions are an all too prevalent injury occurring in approximately 2.8 million patients yearly.2 These range from athletes in grade school to collegiate and professional athletes, to children on the playground riding their bikes and skateboards, to people like myself who were running to catch a ball and ran face first into a yard barn. These are two protein markers that are released into the bloodstream within twelve hours after mild traumatic brain injury and can be detected via serum testing within three to four hours after the laboratory draw is completed. Whether or not these proteins are present in the blood can aid in determining if a patient has an intracranial mass or lesion that may be seen on imaging, or whether the imaging technique will be normal. This information can be helpful for healthcare providers regarding whether computed tomography scans of the head would be needed or not. However, it has been seen that the majority of patients who undergo head imaging with a CT scan after mild traumatic brain injury have normal findings. 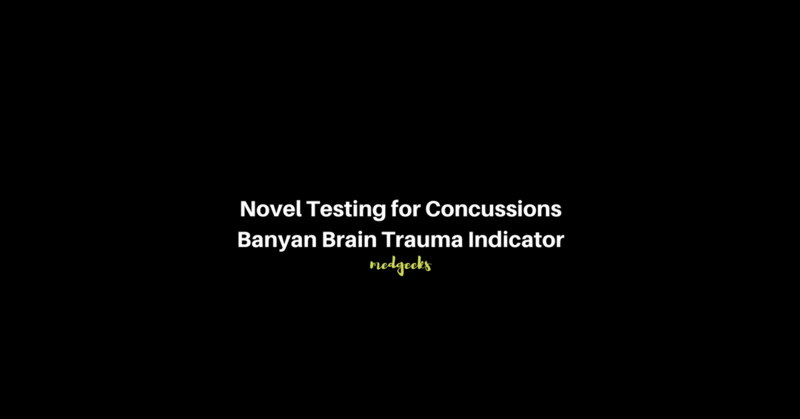 The novel Banyan BTI testing will give healthcare providers a new tool to assess for potential concussion-related brain injury, but also would reduce the number of CT scans completed on patients with mild traumatic brain injury. Thus saving the healthcare system the cost of unneeded CT scans, and saving the patient from unneeded radiation exposure. The U.S. Food and Drug Administration gathered data from a multicenter clinical trial in which 1,947 blood tests from adult patients were collected where mild traumatic brain injury was suspected. They then compared the results from the Banyan UCH-L1 and Banyan GFAP tests versus the results from the CT scans of the head in these patients. The serum testing yielded positive results for potential intracranial lesions in 97.5 percent of patients who indeed did have pathological findings on CT scans. This serum testing also found negative results for a possible intracranial lesion in 99.6 percent of patients who had normal CT scan without any intracranial pathology. The FDA predicts that this test can be used by healthcare providers to rule out the need for CT imaging in at least one out of every three patients with mild traumatic brain injury. 1. AAFP News. FDA Approves Novel Blood Test to Detect Concussions, 2018, February 23. Accessed: February 26, 2018. 2. U.S. Food and Drug Administration. FDA Authorized Marketing of First Blood Test to Aid in the Evaluation of Concussion in Adults. 2018, February 14. Accessed: February 22, 2018. 3. Family Practice News. Blood Test Approved for Patients with Concussions, 2018, February 15. Accessed: February 26, 2018.